DieHard Cricket Fans: Champions Trophy: A Clinical Victory for the Mustache ! 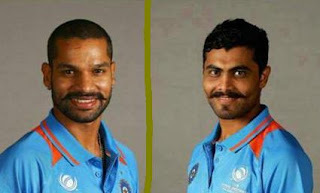 Champions Trophy: A Clinical Victory for the Mustache ! 25 June 2013, is the right day to write about 23 June 2013 because it was 30 years ago on this day that Cricket became a religion for me and we subsequently found a God. We have discussed million times about 25 June 1983 and 2 April 2011 and about the T-20 World cup win. Today, it is about what was it about the Champions Trophy win ! It was a clinical performance by Team India and that was established by the uniform they wore during the victory celebrations. Performance with Clinical Efficiency ! Here is a list of people and attributes that contributed towards Indian win in the Champions Trophy. Sehwag and Gambhir: By becoming too big for their boots post 2011 World Cup win, the duo forgot to walk the talk and did only talk and thus opened a channel for new openers. Zaheer Khan: Repeated injuries and advancing age have brought the Khan to the verge of retirement. Sachin Tendulkar: By declaring his retirement from ODI Cricket without scoring the 50th 100, he made breathing easier for the younger lot. Harbhajan Singh: His continued lackluster show helped the younger spinners to bowl without the 'Monkey' on their back. Sandip Patil and Co: I was one of the people who criticized some of the selections. Well, I still stick to my guns regarding Ishant but he didn't do that badly. The selectors did show balls in keeping Viru and Gauty out and that was their BEST decision ever. Sreesanth: He was one of the main uniting forces for this team. His family's allegations about Dhoni and subsequent rumble in the ranks brought the team members closer in the face of adversity. England: The cold and rainy English summer made Indians forget the deluge after the IPL. The rains kept them together. And of course there were some old wounds ! Australia: The way they collapsed to 64 all-out in the practice game brought enormous confidence in the Indian bowling ranks. They never looked back from there. Dinesh Karthik: His back to back centuries in the practice games made Rohit Sharma and Shikhar Dhawan realize, "If DK can, why not me ?". Rest is His-story as we know. The Mustache: The Golden Ball and Golden Bat both went to the 'Men with the Mustaches'. It has brought back the mustache back in fashion. The Rule of the Mustache ! Rohit Sharma: The cool English weather must have helped Nohit to keep his head cool. His talent was never in doubt but his ability to apply always was suspect. May be the disappearance of the big thee and elevation to opening and Dinesh Karthik's stupendous success in side games fired him up. He definitely did well though the proficiency to throw his wicket continues to haunt him. Ishant Sharma: His bowling was generally ordinary to bad except for the match against Sri Lanka. But seriously, Bhuvaneshwar deserved the Man of the Match for the pressure he created. Ishant often got wickets because 3 others [Kumar, Ashwin and Jadeja] were hardly allowing any room to score. But to give the Devil his due, he did get wickets and we can't deny that. Ashwin: He was overshadowed by Jadeja during the tourney. But the carrom ball he bowled against Sri Lanka will become a part of the Cricket folklore. Bhuvaneshwar: After the practice matches, he found his groove in the English weather and remained there throughout the tourney. His was almost a McGrath like act. Umesh Yadav's wife: Umesh Yadav's five for against Australia in the side game was inspired by his newly wed wife. Indian players seem to be on performance enhancing marriages these days. Ask Dhawan and Pujara. Dhoni: By reposing faith is the highly talented yet under-performing Sharmas, Dhoni reaped the rewards during perhaps his most conflicting period as Captain. It was a tough period for his away from the field with the conflict of interest issue. His golden touch seems to have come back to him. Duncan Fletcher: 8-0 in 8 away tests and a home series loss to England. He was under fire. From there, it was all about resurrection. In a way it was the best thing to have happened to the team because from there, it was only way; Up and they did it ! Virat Kohli: He didn't score big. But for once he was not required to pull off an impossible chase during a group match only to see his team getting knocked out by net run rate. Suresh Raina: Honestly, Rain played more often than Raina. But his fielding combined with that of Dinesh Karthik, Virat Kohli, Ravindra Jadeja, Rohit Sharma and Shikhar Dhawan made India the best fielding unit during the event. That made a large impact and even Ishant got wickets. His Highness Ball-Veer Sir Ravindra Jadeja: One ridiculed by approximately 80% of India just about 14 months ago, Jadeja has shown the kind of attitude not seen in an Indian player since the days of Ravi Shastri. He's the opposite of Rohit Sharma. He has moderate talent but he has maximized that with a killer attitude. In short Ravindra Jadeja is "Walking talking Attitude with a head, trunk and limbs attached". For me, he was the player of the tournament ! Shikhar Dhawan's Twirl: Ever since he twirled his mustache and flashed that wide angled grin after his debut test century, Dhawan has made a huge difference to India's fortunes. He now evokes almost the same kind of awe that Viru used to do in his heydays. A Left handed awe we can add. IPL: The team that had all players playing IPL won the Trophy from those who didn't have anyone in IPL or very few. So let's cut the crap about IPL harming Indian Cricket. Bell: The Bell run-out and Calling Bell incident and all the gamesmanship of English Cricketers during the previous tour of England had left a lot of bad taste in the mouth. It was waiting for poetic justice and it happened in so many ways. But nothing can best the stumping of Bell decision which went in favor of India. And who got the wicket ? Jadeja ! He was the mascot for Team India this time. India played unchanged throughout the tournament and were never in fear of losing a match except the rain hit Final. And once there, it was all about pressure and the team with the coolest of them at the helm, pulled it off. Hats off to Dhoni and boys and the support staff, once again ! Finally, India became the first team to win the Champions Trophy by playing a T-20 match in the Final. They now have won everything from 50 over world cup, T-20 World cup, Champions trophy and also Champions Trophy T-20 !